Co-director comes to Landmark La Jolla Village Cinemas. 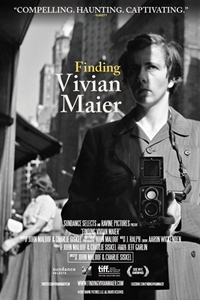 Charlie Siskel — who, along with John Maloof, produced and directed the documentary Finding Vivian Maier — will stop by the Landmark La Jolla Village Cinemas this weekend for a pair of audience Q & As. For those unfamiliar with the name Vivian Maier, join the club. It wasn’t until a few years back when Maloof purchased a box of her negatives at auction (sight-unseen) that the now heralded street photographer’s star began to rise. With tens of thousands of photos to guide them, Maloof and Siskel clone the life of the secretive serial nanny, blessed with an “authentic eye,” through her art. It’s a film that never fails to fascinate as we sit in bewilderment, eavesdropping on their discovery. Charlie Siskel will be at the La Jolla Village Cinemas this Saturday, April 19, after the 7:30 pm show, and to introduce the 9:40 pm show. Even if you can’t get out this weekend to meet him, don’t miss the movie.